This thin, brown, sweet-sour condiment turns up in barbecue sauces of all stripes and types—from the tomato-based sauces of Kansas City to the butter sauces of New Orleans to the black dips of Kentucky. The reason is simple: Worcestershire sauce contains something for everyone—sweetness in the form of corn syrup and molasses, acidity from tamarind and vinegar, saltiness provided by soy sauce and anchovies, with garlic and cloves for spice. Like mushroom ketchup and A.1. 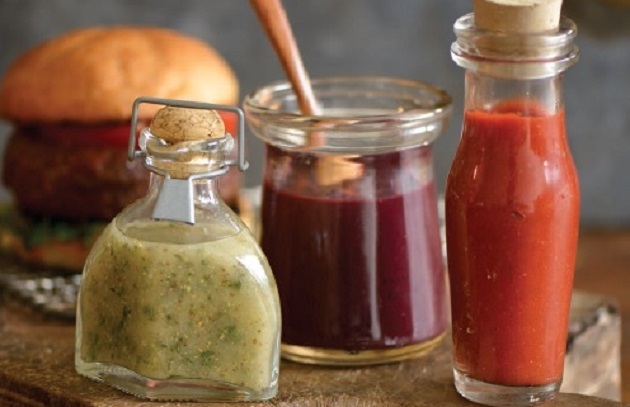 Sauce, Worcestershire was born in the heyday of the great English table sauces. According to David Burton, author of The Raj at Table: A Culinary History of the British in India, the recipe originated in India and was brought back to England by a former governor of Bengal, Lord Marcus Sandys. In 1835, Lord Sandys took his recipe to the chemist shop of John Lea and William Perrins on Broad Street in Worcester and asked them to brew up a batch. The resulting mixture was so fiery, it “almost blew the heads off Mrs. Lea and Perrins,” according to Burton. They deposited the barrel in a back corner of the cellar and promptly tried to forget it. The chemists stumbled upon it a few years later, and, morbidly curious, they tried it again. With age, the Worcestershire had mellowed into an extraordinary sauce. The recipe was hastily purchased from Lord Sandys and in 1838, commercial Worcestershire sauce was born. According to Adrian Bailey and Philip Dowell, authors of Cooks’ Ingredients, the original Lea & Perrins recipe contained walnut and mushroom ketchups, sherry, brandy, and even pork liver, which has been eliminated from the American formula. Today the sauce is enjoyed all over the world. Many companies manufacture Worcestershire sauce today, but no one makes a better one than Lea & Perrins. This is the sauce you should use for the recipes in my books. Many American rub makers add a freeze-dried Worcestershire sauce to their spice mixes. This flavorful powder is available here. This blog is excerpted from Barbecue Sauces, Rubs and Marinades.